Landlord Diaries » Blog Archive » Nasty is as Nasty does! Nasty is as Nasty does! There is a difference between dirty, sloppy, cluttered, and plain old nasty. If you live nasty, you are nasty and therefore act nasty. If this is all true then I have a story for you. I have a tenant who has a nasty attitude, a nasty lifestyle and a very nasty mouth. Of course she is getting evicted after calling code on us for a roach infestation , having no heat and missing smoke detectors. First of all you live like a pig! If you keep food out, don’t wash dishes, never clean and throw the trash on the floor – is it any surprise you have roaches?? If you keep ripping the t-stat off the wall is it any surprise you don’t have heat? If you knocked down all the smoke detectors is it a surprise you can’t find them now? But yet you have the nerve to call code . . . . Let’s be clear YOUR RENT WAS NOT PAID – YOU HAD NO INTENTIONS OF PAYING IT – SO CALL CODE AND BUY SOME TIME!! So, we go to court and of course she loses as she has not paid rent in two months. She is given a week to remove herself and personal belongings from the property. Naturally that does not happen so the Marshall is called, she is served with 72 hour notice. 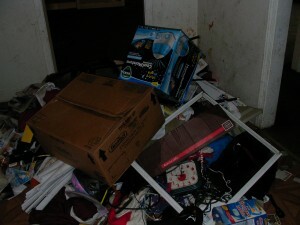 Then public assistance calls me stating they will pay her back rent and her rent going forward. No thanks – there is not enough money in the world for me to keep her as a tenant – goodbye! And still no movement on her part. I then meet the Marshall at the property for a 1:00pm eviction. Not surprisingly not a thing is packed. The baby daddy, kids and the tenant are all screaming at each other. I tell the Marshall I will give her until five, he goes to relay the message and gets cursed out like he has never been before. The tenant completely goes off on him. The Marshall calls the police and things get crazier from there. It was 7:30pm that night I finally locked the doors behind her as she removed herself from the property. In between all the cursing and name calling she is spewing at me her main concern is when is she getting her security deposit back??? Are you serious, look at the condition you left this apartment in – it’s trashed and you owe 2 months rent! I kindly told her my attorney would be in touch. She screamed, “I ran a nasty roach motel and that she is coming for her money!” I wish her next landlord the best of luck. Matter of fact I can’t wait for the landlord to call for a reference – that’s gonna be a great conversation. You want to call code on me ……I gotcha! This entry was posted on Thursday, March 24th, 2011 at 5:42 pm	and is filed under Don't get mad at me cuz you didn't pay the rent!. You can follow any responses to this entry through the RSS 2.0 feed. You can leave a response, or trackback from your own site.